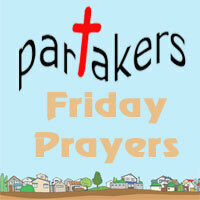 Welcome to Partakers Friday Prayers on Friday the 22nd of July, 2011. Let us pray together! Father, as we commence, let our hearts and minds be right before you. May your everlasting mercy, grace and love be shown in hearing these petitions! We thank you that you are interested in every facet of every person. We thank you for sending your Son Jesus into the world so that we can have access to you through Him. It's in His name we offer you these praises and petitions in the power of the Holy Spirit who lives inside those who are your children. Amen! We bring before you these grieving families and we pray You will give comfort in their grief and as funeral services are prepared. Claire, Eileen, Geraldine, Kath, Maureen, Hannah, Elsie. Chris and Genevieve. you may provide a healing touch and guide the hands of the medical staff treating them. We lift to you Kathy who is recovering from surgery. Be with her and her family as they support her! Give them an assurance of your presence and help the medical staff treating her. We bring before you now, Lynn, who requires healing after falling and injuring her face/nose, arm and other parts of her body. We also bring her brother before you who may need to have both kidneys removed, without getting a transplant. As well as her co-worker who may have to go on dialysis. We also bring before you Beverly that she may be healed of long-term injuries and that you would guide and provide for her as she ministers to others. We lift our brother Richard to you who is just coming out of a time of depression. Lord, please lift his heart and let him know the presence of you, Almighty God, with him. Father, we also lift before you, all those facing challenging situations: such as confinement at home, geographical isolation, lack of employment, health issues, and financial pressures. O Father, please meet their needs in what ever challenging situation is being faced, and we put ourselves in your hands to help meet those needs where we can. Father God, we lift to you once again the people affected by the famine in the Horn of Africa. Help those people Father, in ways which only You can achieve. Fire the imagination of people to solve these ongoing problems. Enlighten people to give generously, to share and to be looking to the interests of others. Father, tear down the barricades being put in place by Muslim insurgents and that aid being offered will get through. May justice and peace come to places where injustice, strife and conflict currently dominate! Where there is chaos, bring order and where there is hatred, may love be sown. We pray that in areas of need following natural disasters, that aid will get through and infrastructure rebuilt. Amen! Our Father God, we lift before you all those who are preaching, leading and participating in church services around the world this weekend, we ask that the Holy Spirit would guide their minds and that the worship will be in Spirit and in truth, that the Word as it is faithfully preached. For those in countries where to meet other Christians is illegal or not condoned by the government, we ask that you continue to strengthen, guide and uplift them. Let them know through Your Spirit, the Spirit that lives within all believers that we are praying for them. Amen! Now as we close, may the God of hope fill you with all joy and peace in believing, that you may abound in hope by the power of the Holy Spirit.